The sister of Facebook CEO , Randi Zuckerberg wants to put an end to online anonymity.Fcaebook wants to force people to use their real names on Profiles. 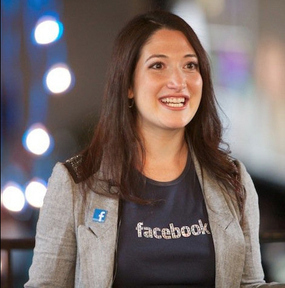 Randi Zuckerberg is Facebook's marketing director, believes users would act much more responsibly on the Internet if real names at all times were compulsory. Randi Zuckerberg was speaking during a presentation hosted on Tuesday by Marie Claire magazine on cyberbullying and social media. She said "the use of real names online could help curb bullying and harassment on the web.I think anonymity on the Internet has to go away... People behave a lot better when they have their real names down. ... I think people hide behind anonymity and they feel like they can say whatever they want behind closed doors." She added, "There's so much more we can do...We're actively tying to work with partners like Common Sense Media and our safety advisory committee." Whereas Christopher Poole, founder of 4chan says, "Where there's no risk of failure, experimentation flourishes. On websites that require you to login via Facebook, the cost of failure is really high because you’re contributing as yourself. As a result, mistakes are attributed to who you are. I believe real names should only be required in scenarios where your actions can hurt others; in other cases, anonymity is just fine."